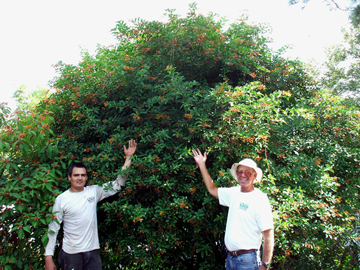 There's no such thing as "Dwarf Firebush," as shown here by FANN members Oliver Herrera (left) and John Sibley (right, FANN president and owner of All Native Garden Center), standing next to a "Dwarf" Firebush. Butterflies and hummingbirds are constant reminders of why gardeners who live in southern and coastal Central Florida cultivate our native Firebush (Hamelia patens var. patens). This ever-blooming shrub or small tree (to 15′) seems to always have butterflies around the flowers. Hummingbirds, bees, and wasps frequent the flowers as well. As an added bonus, fruit-eating birds such as mockingbirds, catbirds, and blue-headed vireos savor the small purple fruits, and the leaves serve as larval food for the Pluto Sphinx, a hummingbird-like moth that can be seen visiting the blossoms at dusk, or laying eggs on the leaves. On the left, native Firebush leaves are broadly lanceolate, in whorls of 3-4 (typically 3, as shown here), and often tinged with red. Leaves and young stems are covered with appressed (flattened) hairs. 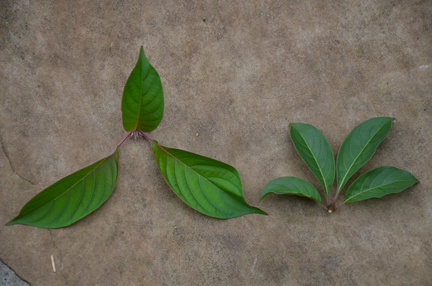 On the right, non-native Firebush, of a variety frequently marketed as "dwarf" (but not dwarf), with glabrous (no hairs) leaves whorled in groups of 3-4 (typically 4, as shown here). Florida’s native Firebush has many horticultural attributes, but it is decidedly cold sensitive and can only be cultivated successfully outdoors in USDA Zones 10, 11, and the warmer portions of Zone 9. In Zone 8 northward it will be killed in winter, so it is sometimes grown in those colder regions as an annual. The broadly lanceolate leaves are in whorls of 3-4 (typically 3) and are often tinged with red, especially when grown in full sun. The leaves and young stems are covered with appressed (flattened) hairs. Narrow, tubular, orange-red flowers are in terminal and axillary clusters, each flower ranging from 1/2-1″ long and about 1/8″ wide. The flowers can be yellowish when in bud, turning orange after opening, and then orange-red once they are pollinated – but the dominant color on open flowers is typically red, or orange-red. L-R: Native Firebush (Hamelia patens var. patens). Non-native H. patens var. glabra (frequently sold as 'African' or 'Dwarf' and sometimes 'Compacta'). Non-native H. cuprea. Non-native hybrid of H. cuprea and H. patens. Hamelia patens var. patens has the widest natural range of any other species in the genus. It occurs from Marion County in Florida south through the Florida Keys, the West Indies, and Mexico into South America. Its distribution in South America is mostly from Venezuela, Colombia, and Ecuador to Peru, with isolated populations in Paraguay, Bolivia, Brazil, and Argentina. It is regarded as one of the most common shrubs in tropical America and is the only member of the genus native to Florida and the Bahamas. Hamelia is a small genus of 16 species with a mostly tropical American distribution and commemorates French botanist Henri Louis DuHamel de Monceau (1700-1782). The name means “spreading,” alluding to the growth habit. Sometime in the mid-1980s, a non-native variety of Hamelia patens was introduced into the Florida nursery trade, but, oddly enough, the material came from a botanical garden in Pretoria, South Africa. The plant quickly became popular under the misnomer Hamelia patens ‘African’ or “African Firebush,” and erroneously sold as a Florida native by many nurseries and garden centers throughout the state. Its correct botanical name is Hamelia patens var. glabra, which has a natural range that encompasses extreme southern Mexico through Central America and into northern South America, as well as Trinidad and Tobago. As the name glabra implies, the leaves are glabrous (without hairs) and are whorled in groups of 3-4 (typically 4). The flowers of this variety are mostly yellow with a reddish orange base, often with thin red lines along the outside of the floral tube. By examining the bottom of a leaf through a magnifying lens, small hairs on the veins are visible, but the leaf blade is essentially smooth. Hamelia patens var. glabra is also sold under the trade name ‘Firefly,’ and this cultivar is advertised as having slightly smaller leaves. Other nurseries, both in Florida and on the Internet, offer a compact version of Hamelia patens var. glabra, with its typical orange-based yellow flowers, and refer to it as ‘Compacta’ as well. It is also sold as “Dwarf Firebush,” even though the plant may eventually exceed eight feet in height unless it is pruned. A large number of Florida nurseries also offer Hamelia nodosa as “Dwarf Firebush” but this is nothing more than a botanical synonym of Hamelia patens var. glabra. Another species that has become popular in the nursery trade is Hamelia cuprea, which is advertised by many Florida nurseries as “Bahama Firebush.” This common name is another misnomer because Hamelia cuprea does not occur in the Bahamas. It is native to Jamaica, Cuba, Haiti, and the Cayman Islands. Perhaps “Antillean Firebush” would be a more appropriate common name. This very ornamental small tree (to 20′) has glossy, light green or copper-colored (cuprea means “coppery”) elliptic leaves in whorls of 3, which average 3″ long and 1 1/2″ wide. The bell-shaped yellow flowers are mostly 1-1/4″ long and 3/4″ wide, turning reddish orange with age. The flowers have six thin red longitudinal stripes and six reflexed lobes. Bees frequent the flowers along with occasional hummingbirds and butterflies. To complicate things even further, Hamelia cuprea hybridizes with Hamelia patens, and the hybrids produce flowers that are intermediate between the two species, resembling Hamelia cuprea in color but are much narrower, measuring about 1-1/4″ long and 1/4″ wide. At present, no other members of the genus are available commercially in Florida although one Florida nursery currently advertises Hamelia macrantha, but this is likely a misidentification of Hamelia cuprea. However, a quick check on the Internet revealed one other Florida nursery advertising Hamelia macrantha with an accompanying photo of a Hamelia cuprea x Hamelia patens hybrid. True Hamelia macrantha is not known to be in Florida. It is a rainforest species native from Costa Rica south through Panama and Colombia to Ecuador. Its flowers are bell-shaped, wider than Hamelia cuprea, and solid yellow. Whether or not any of the non-native members of this genus will escape into natural areas in Florida and become a problem for resource managers has yet to be seen. Non-native Hamelia patens var. glabra readily escapes from seed around cultivated specimens and may contaminate the gene pool of Florida’s native Firebush through hybridization, so it appears to be the plant to watch, especially with its increasing popularity as a landscape plant in Florida. About the author: Roger Hammer, is a Miami-Dade County naturalist, author, and photographer. He served as Senior Interpretive Naturalist for Miami-Dade County Parks & Recreation Department for 33 years and has a statewide reputation for botanical knowledge. Roger discovered two new orchids in Florida, now listed as endangered species, has received numerous awards and is a frequent invited speaker at plant-related events, including having twice been the opening ceremony speaker for the World Orchid Conference. He is the author of three FalconGuide® reference books: Everglades Wildflowers, Florida Keys Wildflowers, Everglades National Park, and folding laminated wildflower identification cards for Southeastern Florida, Southwestern Florida, and Central Florida. His books and plant ID cards are available at all major bookstores.